Commedia dell’arte, or “comedy of craft” is an old Italian style of theatre born of several stock characters related to specific social types, e.g. a merchant, a doctor, a servant, etc. Physical comedy is standard within this genre, and so it is with California Theatre Center’s latest installment of their summer repertory series. Originally written by Carlo Goldoni in 1743, The Servant of Two Masters is intended as a farce as it chronicles the antics of Truffaldino, a servant who finds himself in the employ of two masters, although the story starts before he and the audience are introduced. The action takes place in Venice. Hearing that Federigo Rasponi is dead, Clarice (Federigo’s betrothed) is freed to follow her true love, Silvio. Their fathers, Pantalone dei Bisognosi and Dr. Lombardi respectively, agree to the union and plan the wedding, but before Silvio and Clarice can tie the knot, Beatrice Rasponi, who’s impersonating her dead twin brother, Federigo, shows up to claim “his” bride, and more importantly, the dowry. In truth, Beatrice is really just trying to claim the dowry and find her lover, Florindo Aretusi of Turin, who killed her brother Federigo in a duel, so that they could be together, but she can’t let on who she is or why she’s really there. “Federigo” has hired Truffaldino as “his” servant, and brings him along on the journey. Unfortunately for Beatrice, Brighella, a local innkeeper, recognizes her and threatens to disclose her identity, although she quickly talks Brighella out of it, and instead enlists her help in keeping the subterfuge alive. Rounding out the story, Smeraldina, Clarice’s maid falls in love with Truffaldino. Unbeknownst to Beatrice, once “Federigo” and Truffaldino settle at Brighella’s inn, Florindo shows up and secures lodging there as well. To bring truth to the title of the story, Florindo also hires Truffaldino as his servant, and from there it gets complicated and very funny as Truffaldino tries desperately to serve both of his masters without each finding out about the other. 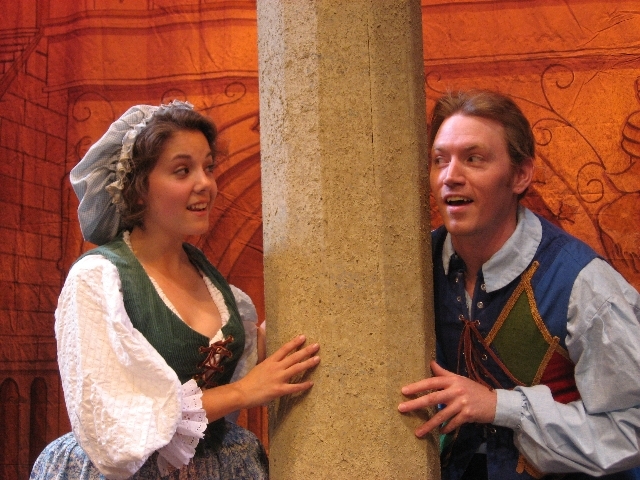 CTC’s General Director, Gayle Cornelison, retains the commedia dell’arte trademarks and farcical elements in directing his adaptation of this long-lived comedy. CTC’s production begins with Noel Wood, as himself, giving the usual curtain speech to the audience. Wood is plagued by humorous interruptions following all manner of “problems” within the production – a betrothal broken, actors going missing, costumes not being ready – some a tad gaudy or coarse. From there, the “real” opening act begins with the full company entering as jugglers, acrobats, and some conducting sword play, all before getting into the true plot. Cornelison’s cast then begins the story with: Michael Detmer as Silvio, Sarah Thermond as Clarice, Wood as Dr. Lombardi, Stefan Fisher as Pantalone, Corinne Bupp as Smeraldina, Clara Hirsh as Brighella, Justin Karr as Truffaldino, Jenna Pinchbeck as Beatrice, Daniel Joyce as Florindo, and Kyle Schuller as the waiter/porter. As part of the commedia dell’arte style, all of the actors speak to each other in dialogue, but their thoughts and explanations are directed straight to the audience, at times asking for its approval before taking action. A pleasing theatrical device, it facilely keeps the audience fully engaged in the story. All of the actors transform from themselves in the pre-show to strikingly different characters. Wood’s own voice is unaccented and friendly, but as Lombardi, he’s a pompous, highly educated man of the law, clothed in a black and white suit reminiscent of 18th century academia, speaking in a heavy Italian accent, punctuated by use of Latin – all exaggerated for comedic effect. Fisher dons the hunched walk and demeanor of an old, feeble man, trying to marry off his daughter. He and Wood have some farcical exchanges at various moments in the story. Emphasizing physical comedy during each of their arguments, they engage in various creative combative techniques to punctuate their enragement. The young lovers aren’t quite as vivid. Detmer first appears complacent and obsequious in his devotion to Clarice; he later comes off most like a petulant little boy, threatening to run others through with his sword when he feels his intended has betrayed him. Thermond spends the bulk of her time on stage apparently distraught, although her crying isn’t all that convincing as she sounds more like she’s stifling laughter. Bupp takes a fancy to Truffaldino, and with Clarice’s help, she makes a play for him, which becomes a running bit through the story. Her break out moment comes during an argument with Detmer where she dons a modern day feminist stance, chastising Detmer for breaking Clarice’s heart, and challenges him to a swordfight. The writing in this section (or perhaps it’s improvised) seems a tad anachronistic, albeit effective in the moment. Karr is delightful. As Truffaldino is mischievous and self absorbed, Karr uses both appropriately clumsy physical comedy and feigned confusion over his self-inflicted predicaments to develop his character. He’s likeable and effective in surviving unscathed. Pinchbeck and Joyce also play engaging characters. Pinchbeck’s “Federigo” is forthright and confident. Although it’s obvious to the audience she’s a woman, she pulls off the masquerade in the story with aplomb. Joyce’s Florindo carries an aristocratic air, although he is a bit full of himself. Eventually, Pinchbeck is unmasked, and she and Joyce enjoy a decidedly campy reuniting – with musical and lighting emphasis to help. Michael Cook’s single set has only subtle modifications from its first appearance in Around the World in 80 Days, the archways/columns standing firm on three sides of the stage, with all the but the furthest downstage arches curtained – the upstage center curtain is opened at the inn, and closed when depicting Pantalone’s home. Two small curtains in back of side tables are located far downstage right and left, setting up an entertaining restaurant scene where Karr steals the waiter’s job and attends each of his masters without the other’s knowledge. Keeping the period in mind, the scene changes are nicely heralded by recorded baroque music played over the blackouts. Another enjoyable comedic adventure, although this one isn’t aimed at young children, The Servant of Two Masters continues in rotation with three other plays through late July. The rest of the summer rep series includes: Agatha Christie’s Black Coffee, Around the World in 80 Days, and The Emperor’s New Clothes, the last one specifically aimed at children of all ages. All performances are held at the Sunnyvale Theatre located at 550 E Remington Drive, Sunnyvale, CA 94087. Single tickets range from $10 – $25. Discounts are available for students, seniors and groups of 6 or more. For tickets and more information, call the CTC Summer Rep Box Office at 408-720-0873, or visit www.ctcinc.org.